If you’re looking at different types of door handles to provide a focus for your internal doors, a lever door handle on rose is one of the classics. 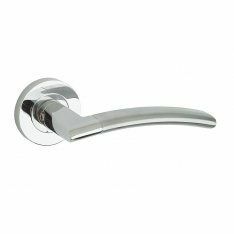 We have a large range of lever handles on rose. Each metal provides a totally different look, allowing you to customise your unique style — chrome, brass, stainless steel, nickel, bronze, gun metal, pewter and hand-forged iron. The metal and finish contribute strongly to the individual look of each of our lever on rose door handles, but the designs themselves just as varied. Whether you’re looking for baroque swirls, like the Set Antique Brass Colchester Lever on rose, or the clean-lined functionality of a modernist style, such as the Set Satin Nickel Davoli Lever on rose, we have the handle for you. We even have a Swarovski lever range — handles in various styles and metals adorned with Italian Swarovski crystals. They range from the bold statement of the Italian Swarovski Crystal & Satin Chrome Diamond Lever on Square Rose to the more restrained Italian Swarovski Crystal & Polished Brass Solitaire Lever on Square Rose. If it’s not our wide choice of lever door handles on rose you’re looking for, that isn’t the limit of our stock. We have an equally broad range of lever furniture on a backplate, as well a choice of knob furniture, escutcheons and snib and release options, together with the unique HOPPE Quick-Fit Plus system if you want fast and easy installation.